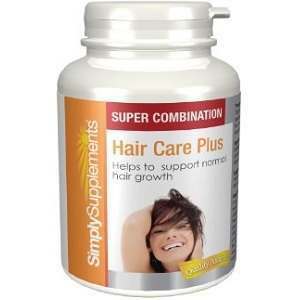 This review is for Hair Care Plus Capsules sold by Simply Supplements. These capsules are supposed to promote the overall health of the hair and the scalp. The ingredients also help the growth of hair by supplying nutrients to the hair follicles. Read on to learn more about the all-natural supplements. Take two or three capsules daily or as directed by your doctor. You may have to take the product for as long as three months before you notice any difference in your hair. Make sure your physician is aware of any other medications you are taking. If you are pregnant or nursing, let your doctor know you are considering taking this supplement. There are no known side effects listed on the website for this product. As long as it is taken as suggested, there should be no side effects. If you notice any effects, they will usually subside after using the product for a short period of time. There are no guarantees based on satisfaction or if the product works for you. The website that is promoting the product will give refunds or exchanges if there was an error in ordering or if the product is returned in the unopened package. There are numerous customer reviews on the website that comments on all of the products they sell. Most of the reviews are favorable and promote both the product and the company that is selling it. Hair Care Plus Capsules sold by Simply Supplements seems to be a quality product that will do as it promotes if it is used consistently and continually. There is no guarantee on the product for satisfactory results. In addition, there were plenty of customer reviews on the website but none of them were for the Hair Care Plus Capsules. Because of the fact that none of the customer reviews included this product may be a cause for concern. There are many other products out there that claim the same results with many more nutrients for the entire body. John Brownstone	reviewed Simply Supplements Hair Care Plus	on November 24th	 and gave it a rating of 3.